A simple & beautiful gift for Christmas...our favorite bath salts, bubble elixir, lotions, and soaps. 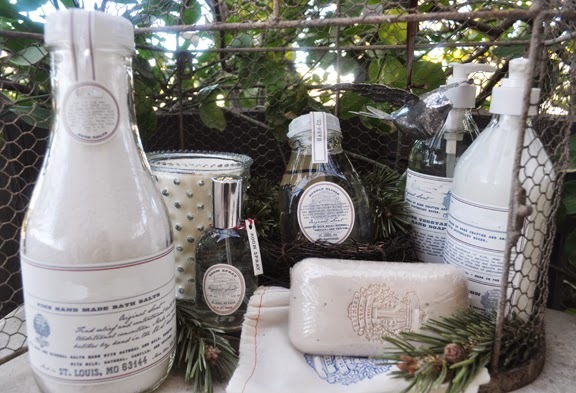 Honest and clean scent that lifts the spirits and calms the senses. The Soap. Find relief with this saddle shaped natural vegetable soap, nestled in a reusable hand stamped muslin bag. Made with colloidal oatmeal which is known to soothe irritated and itchy skin with the added bonus of a protective barrier that helps maintain moisture to keep skin smooth and silky. Oatmeal contains saponins that help remove dirt and oil from pores. Ground oatmeal helps to lightly exfoliate the skin.